Hi Everyone – The LaMaLu Boutique blog is moving. Click here to visit the new blog. Now that we’re past Memorial Day, we’ve made it to the “official” start of summer (at least here in the south). Summer in NC, to me, is lemonade, front porches, cookouts, concerts, beach visits, pool time and fun dresses and tops. 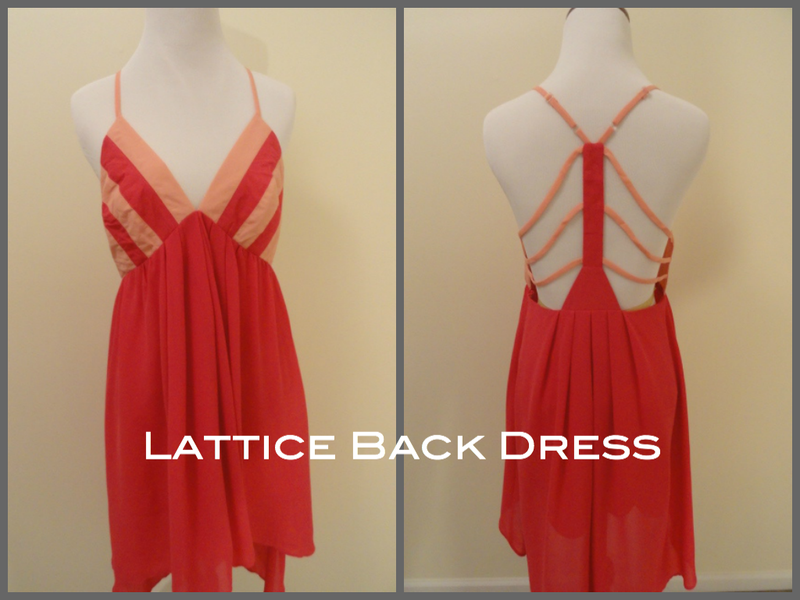 Lattice Back Dress by Esley. This is my favorite and I’m buying it for myself – that’s how much I like it. 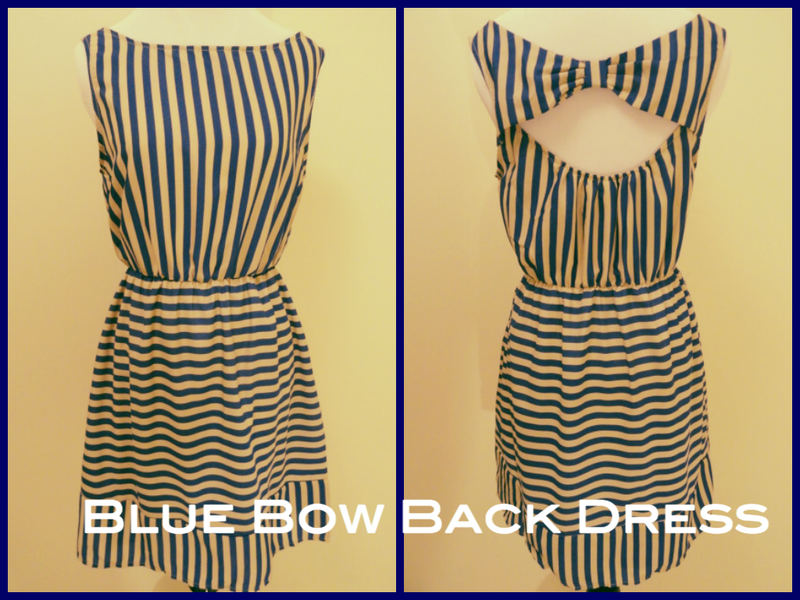 Blue Bow Back Dress – fun and sweet. 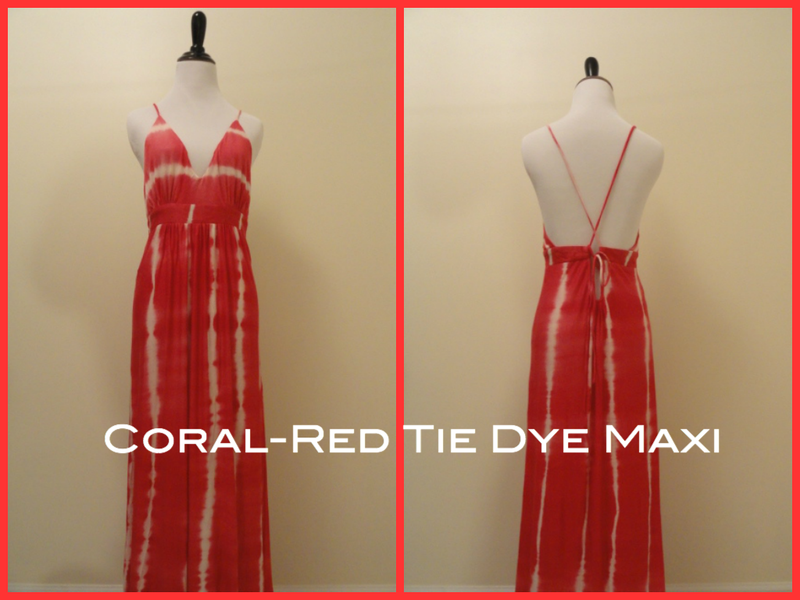 Coral-Red Tie Dye Maxi – This is a super soft and long maxi dress. Perfect for a cookout or a concert on the lawn. Which one is your favorite? What is your go to summer style? LaMaLu.com is now live. Here are some of our new arrivals!!!! LaMaLu.com is launching Saturday June 1st – at 12:00 AM. 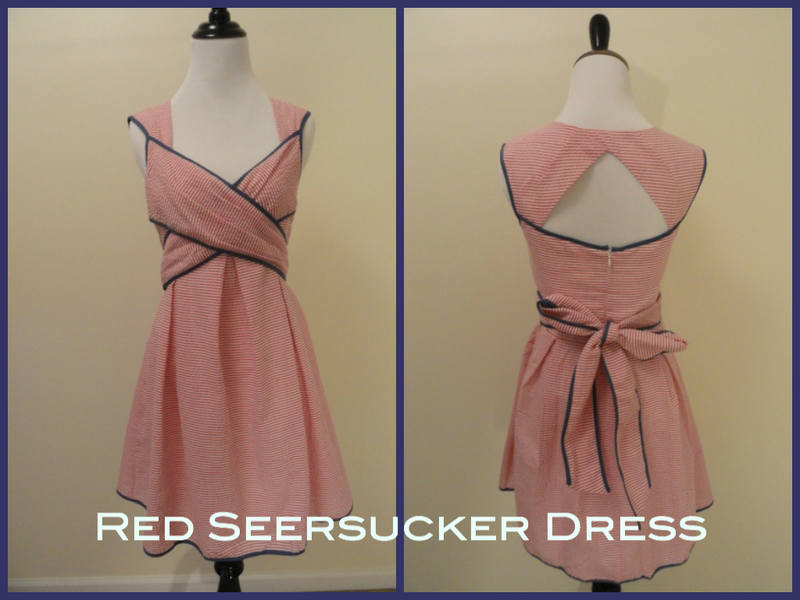 What do you think of our preview dresses? LaMaLu Boutique launches in 5 days. FINALLY! I have so many things planned so stay tuned to the LaMaLu Facebook page, Instagram @shoplamalu or here on the blog for a sneak peek of what is to come. I might even be posting a promo code (spoiler alert: I am). Saturday June 1st is the big day. Every single day is a day closer to my dream coming true. Do you know how exciting that is for me? I have less than one handful of things do to before LaMaLu Boutique officially opens. June 1st y’all. Put it in your calendars. If you’re as excited as I am, feel free to check out the LaMaLu Boutique Facebook page or Instagram page @shoplamalu for sneak peeks of cute things I have coming! I don’t think I’ve really gone into too much detail about how I got to this point. I thought it was time to tell you MY story – Behind the Boutique. I’m Lauren. I’m 25 and I graduated from college almost 3 years ago. Time has flown since graduation from Appalachian State University in Boone, NC. I spend my days working in marketing and my nights with my friends and family. 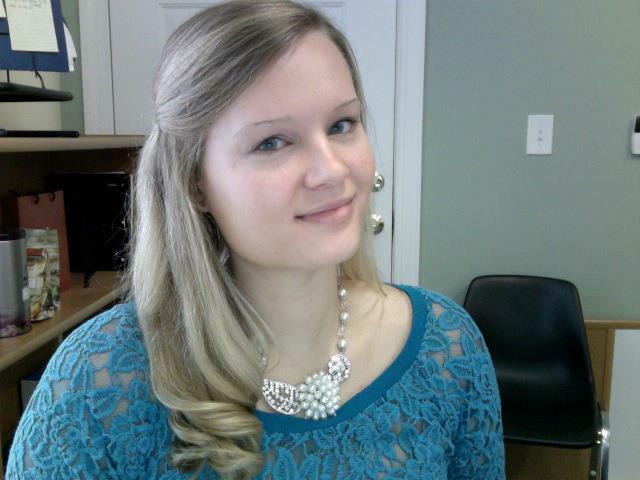 I first dreamed of owning an online boutique in 2009 when I started job searching. I love shopping, especially online (as I’m sure you do too) but being tall – I’m 5’10, sometimes I have trouble finding clothes that are long enough. Especially dresses, my absolute favorite thing. So I started dreaming about a boutique where I catered to taller ladies my mom and I even discussed it semi-seriously but due to my busy college student schedule at the time, nothing really came to fruition. Fast forward to graduation 2010 – I’m jobless and nervous about my future (and moving back in with my Mom) I began writing up a business plan. 12 pages long – I have a degree in Sociology, not business; I was that serious. I even named the boutique. When I started researching, I got even more reassured that this was something I COULD do. It was right about this time that I got my job! I was hired! I quickly shelved my plans and my dreams to happily settle into my 9-5 marketing job. The next two and a half years absolutely FLEW by. One day though, I read this post by Lara Casey and it ALL changed. “You know all those things you’ve always wanted to do? You should go do them.” All of my ideas and dreams were suddenly all I could think about. If I didn’t try, I would never know what could be. Failing at my dream didn’t matter, what really mattered, was failing to realize my dream. Procrastination wasn’t an option any longer. I knew what I had to do – I had to Make. It. Happen. As my boyfriend was gone on deployment, I had alot of time on my hands. At this point, I had big dreams and time to make them come true. One cold day in January, I took the jump and applied for an LLC – I remember how nervous I was standing in the post office my hands shaking as I waited to mail my application in to the State of NC! Once I mailed it though, I felt almost immediate relief I just knew I was making the right decision for me. I worked nights and weekends on my business plan and trying to get my licenses together. I certainly ran into some bumps in the road, particularly in the naming process. You already know about my struggle to find a name for the boutique, but you didn’t know that my original name, from 2010 was taken by the time I was ready to make my dream come true. So between that, finding funding and figuring out what I needed to do to get everything started, there were definitely a few tears shed. I had to apply for a special permit in order to be able to even apply for a business license. Luckily, I won the permit but I definitely was very nervous speaking in front of the Raleigh Board of Adjustment. It was actually just after I won (and was feeling really confident) that I got a call from my lawyer recommending that I change the boutique name. I have to say, I was crushed. I’m so grateful that I had the foresight not to order anything with the previous name before I spoke to my lawyer so that I only had to change my permit information and some licenses rather than everything so that was certainly a blessing in disguise. At the time though, I was pretty down. Matt was still gone, and I was lonely and nervous. That lawyer while very helpful, was expensive and I was discouraged. It was right at the time that the opportunity to attend Making Things Happen came up. I’ll save my Making Things Happen post for another day, but suffice it to say that I felt not only relief but encouragement. I used my MTH experience as a diving board to launch me into the next level where I was going to succeed, no matter what. And that brings us to today – May 7th 2013. Today, I received my first shipment for the boutique. I cannot even put into words the excitement and elation I have from having my dream come true. Doing what fires me up truly makes me so happy. I am just thrilled and cannot wait to launch my boutique. The sky is the limit. Win (1) item of your choice from LaMaLu Boutique. 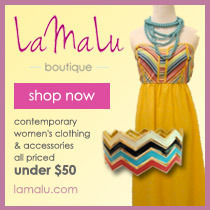 Enter by liking AND sharing LaMaLu Boutique on facebook. Winner will be decided on Thursday! Good luck! You’ve heard the expression, “take one for the team”? Well, today I was at Wal-Mart, picking up clothing racks (literally, I was PICKING up clothing racks) and I guess I lifted with my back and not my knees and OOPs. It’s not that bad, but I did decide to skip the gym since my back and my wrists were hurting. Did I mention I carried three racks (in boxes) all the way through Wal-Mart? I ordered a GREAT printer yesterday night and I can’t wait to hook it up and get everything set up. 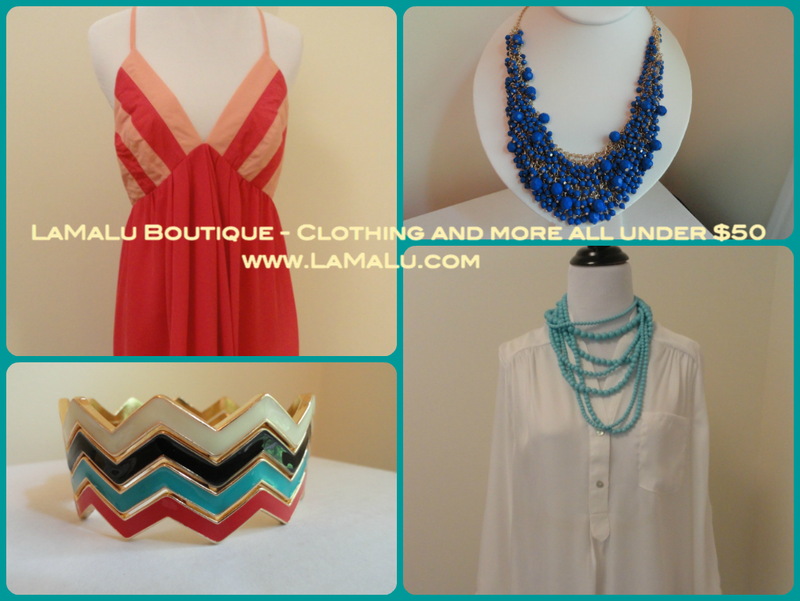 If you didn’t know, LaMaLu Boutique has a facebook page now! I’ll be posting some items that I’m really excited about so check it out. What I am most excited about, is that I placed my FIRST order tonight. I ordered a bunch of cute necklaces, earrings and bracelets and I cannot wait to show y’all. Let me tell you though, picking out only a few things instead of everything is REALLY hard. I’ll be back sometime soon for another update. We’re getting closer to launch and I am so excited! I’ve been pretty busy around here getting things set up for a *fingers crossed* June 1st launch. Last week, I got completed a huge accomplishment and opened a bank account for LaMaLu – that way I can differentiate my money from the boutiques. I ended up going with Bank of America because I am very familiar with them and I’m so glad that I did! They were so helpful and reassuring (and they seemed to have everything together to help small businesses like mine) – multiple employees congratulated me when I used my card for the first time – I guess my excitement was obvious. So with the bank account out of the way, I was able to finally deposit my loan checks and get the ball rolling with everything else that I need. Thanks to an AMAZING Groupon deal, I was able to order stickers and notepads from VistaPrint for LaMaLu Boutique for a great price. I have to say though, 48HourPrint has WAY better prices overall though. I’ll make sure to show you the stickers when they come – the notepads I’m keeping for a surprise for my future shoppers. What I am MOST excited about, is the website. That’s right! I started putting the website together. I decided to go with Shopify because based upon my research they were the most detailed and easy to use eCommerce platform that I found. So far, Shopify has been super easy to use but I haven’t had a chance to add products yet – I’m ordering some clothes this weekend and believe me – I’m REALLY excited. For now though, I will show you a picture of the website – it’s still under construction though so nothing is final yet. Let me know what you think – I can’t wait to launch. The big day is here. The boutique is launching online!